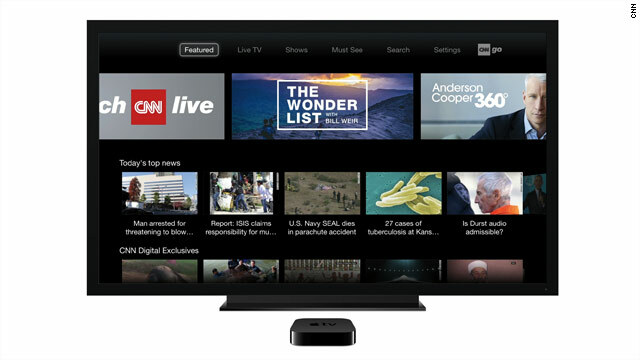 CNN announced today the availability of CNNgo on Apple TV. As part of the industry-wide TV Everywhere initiative, CNNgo is now available in more than 86 million homes and to participating TV providers on Apple TV devices. The CNNgo experience on Apple TV features the largest collection of CNN’s on-demand content to date. Pay-TV customers can log in with their user name and password for access to Live TV and Shows, such as CNN Original Series Anthony Bourdain Parts Unknown, Finding Jesus, Mike Rowe’s Sombody’s Gotta Do It, Morgan Spurlock Inside Man, This is Life with Lisa Ling, The Wonder List with Bill Weir and Anderson Cooper’s nightly news program, AC 360°. All users of Apple TV can enjoy a collection of hand-curated clips by topic – from world and politics to entertainment and tech – in the Must See section. This marks the first Turner brand to launch on Apple TV. CNNgo’s launch on Apple TV joins CNN’s current offerings on CNN.com and on the CNN App for iPad. CNNgo is a next-generation product that gives viewers unprecedented control over their TV news experience through TV Everywhere.